Shocking Before-And-After Drug Use Photos! ‘Getting high is cool’- that’s what the trend shouts out. There have been many anti-drug campaigns held to grab the attention of teenagers to help them get away from the usage of drugs and have a healthy life by letting them in on some of the negative effects on our skin and so on! This post is one of such posts, which, shows some devastating transformation of humans who were users of drugs! This compilation might help put some sense into the teenagers about deadly drugs. All the people that have been reported for the shocking transformation didn’t first start off with heroin or meth or cocaine. They all experimented with innocent drugs like cannabis and alcohols. So, to the kids out there- do not try things at college/school considering these are just innocent drugs because you never know that you might end up being one of these people who scratched their skin to bones and lost teeth and are suffering and FYI, the credits go to their addiction to drugs! This Scottish teenager has been on wheelchair and incurred a brain damage ever since that party in June 2015 where she consumed just one ecstasy pill. She was hospitalized at Glasgow after taking a crystal capsule of MDMA at a house party and was reported to be in comatose. This teenage girl was like every other typical teenager who is fashion-oriented and you can look at her beautiful before-pictures. Now, from a recent video posted on Facebook, shows Amy in a wheelchair who is slurring her speech, heavily, and she cannot move her hands. There’re five-year rapid regression pictures of Adora which depicts meth mouth. The meth addiction has brought upon a horrible decay and grinding where she has lost her teeth and looks more aged than just five years from her then age (48). It has also taken the toll on her unkempt, greasy hair, patches, bruises and scratch marks on the left –side of her face and along her forehead. The sisters from Illinois, USA weren’t aware of their consumption of an infamous popular in Russia drug named Krokodil (Crocodile) thinking it was heroin. They went for the new drug as it was priced lower than heroin. They started getting legions and sores on their legs and arms just the week after first taking the drug. Angie was convinced that she was going to die as these aren’t anything like normal sores but they go to the bones and she’s still receiving treatment at the hospital. This young woman was left disfigured due to an explosion at an illegal meth lab in 2004. However, she was found manufacturing meth even after the terrifying incident. After the incident, police found a small metal pill bottle in Raybon’s purse which was tested positive for meth. Police also found several ingredients that were needed to manufacture methamphetamine. She was arrested and charged with trafficking of methamphetamine and possession of deadly drugs. She has undergone many facial surgeries since the blast! It is unknown what circumstances led this 40+-year-old woman getting the creepy glass eye and the reason probably might be scary and you do not want to know! Her addiction can be highlighted with many other transformations like a sunken chest which showcases her collarbones and some pronounced wrinkles making her look older than she actually is. Her face also has some pockmarks and somewhat mangled forehead. But when you look at her before and after pictures one thing that hits you first is the glass eye. 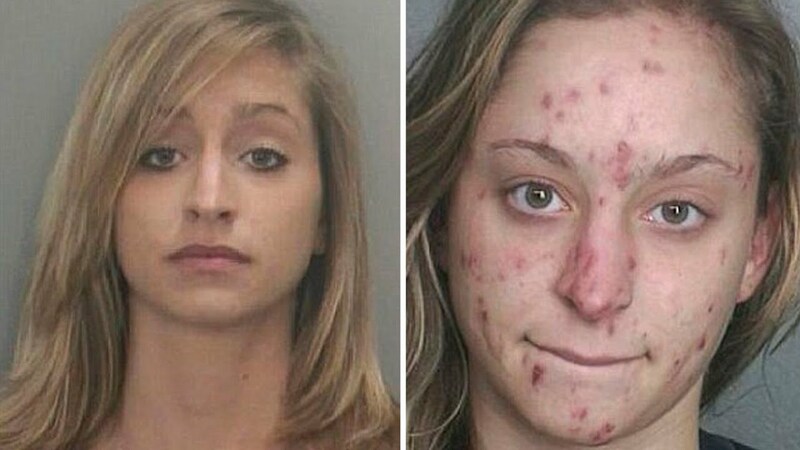 Hopefully, these heartbreaking before-after pictures of drug users scare you or gross you out and help you realize the terrible reactions drugs have on humans! Please say no to these good for nothing substances and have a beautiful life.